Having got the the kit out and ready to go on a dry and well-rolled airfield, our high hopes were yet again dogged by persistent low cloud shrouding Brentor Church and a biting breeze from the north rather than the hoped-for easterly. 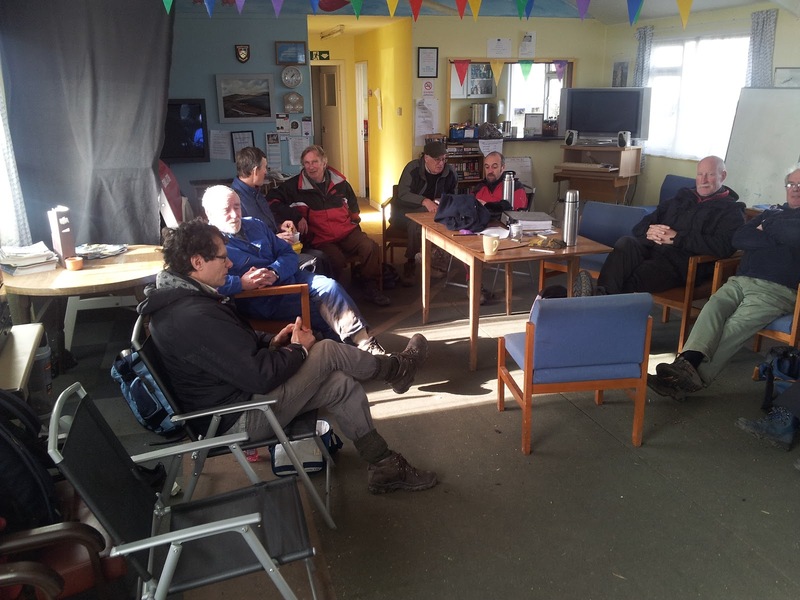 So it was back to the clubhouse and hangar for a day of chores, 'simulating' and socialising around the log fire. A pity, really, because Andrew Beaumont and I had warmed up the launch control caravan with a Calor gas heater. 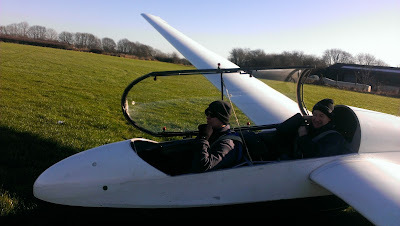 All to no avail this time - but worth a try on the next cold flying day. However, do please remember to keep a door or window open for ventilation. In the hangar, Colin Boyd attended to various 'vice-chairmanic' chores involving signage, No.2 quad bike resurrection and putting the finishing touches to K7M G-DBVB's nether regions; Dave Bourchier continued fettling various items of equipment and Alan Carter made inroads with the character-building task of sanding off layers of vintage paint from a wing of his SF. And while Alan generated clouds of dust, club secretary Sandra returned from a secret mission into Tavistock, after which sounds of 'deep cleaning' were heard from the kitchen. Today's sole visitor was one-day course member Terry Newman who lives in Bromley, Kent and is visiting relatives at Torpoint. 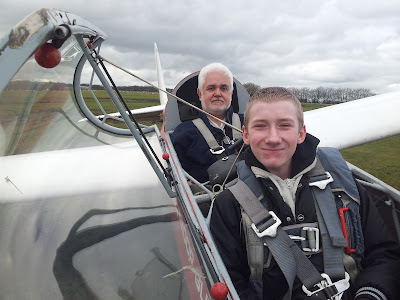 He soloed in a T21 with the Boy Scouts (yes, they were called that in those days!) at Lasham in 1969, and although he sadly didn't get to fly today, he did very well in the simulator. I thought it a bit unfair, though, for Steve Lewis to send him solo on a 'ridge run' in the Slovakian mountains. Andrew Beaumont also spent time brushing up his cross country skills in the simulator, and with the majority of our instructor team present, there was no shortage of advice. A good turnout. Maybe it was the smell of 'Sunday Soarers' Roger Appleboom's Somerset pork sausages and tomatoes, or Dave Parker's Devonian free range eggs and mushrooms sizzling in the frying pan, or perhaps it was the north easterly forecast and the prospect of wave that attracted so many members today, either way both were very welcome. However it was the culinary delights which proved the more reliable - and nourishing! 020 10 knots said the Met office, veering 030 increasing 15-20 knots with height - and another of Roger's pink pigs flew out of the pan - 000 the wind started and there it stayed resolutely stayed all day. So no wave. Again. With a full flying list there no time to let nuances like wind direction avert proceedings - and thanks to Nigel Williamson's double barrel load of Hobnobs down at the winch - we got off to a cracking start. 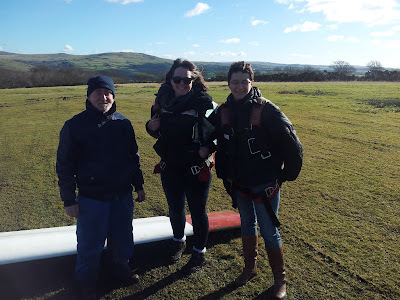 With Sam Deeks and Dave Parker having booked one day courses with Don, it fell to Martin Cropper (who was delighted) to fly Trial Lessons for Gary Stanbury and Lisa Brooks, both from Plymouth. They were followed by youthful 'spring shoot' Trevor Taylor, requiring a check flight before flying the Jantar (was it the temptation of wave? ), and Krzysztof Sekowski, who is hopefully going to convert his Polish solo status to UK solo as quickly as possible. Sadly the weather was just too cold for Marta to fly - perhaps some 'positive (Polish) discrimination' will be in order on next week's flying list. Allan Holland appeared in the afternoon (was it wave?) and check flew the K-8, which is now fully serviceable again, thus allowing Nigel to get his solo reward for winching 7 parts of the day. Sandra Buttery sealed the day with a perfect touchdown in K-13 DMX, just as 'baker's boy' Al Carter proudly announced that he had relieved one of his SF-27 wings of 3 kg of paint (and other products)..! So despite the wind being 30 degrees to the north of where it was predicted and should have been, a very useful 35 launches were made and (once they were thawed out) some smiling faces achieved. Wind light , northerly and it was very cold. I arrived with the expectation of maybe a few circuits but this was not to be. There were not enough club members on site to fly. This was very disappointing. 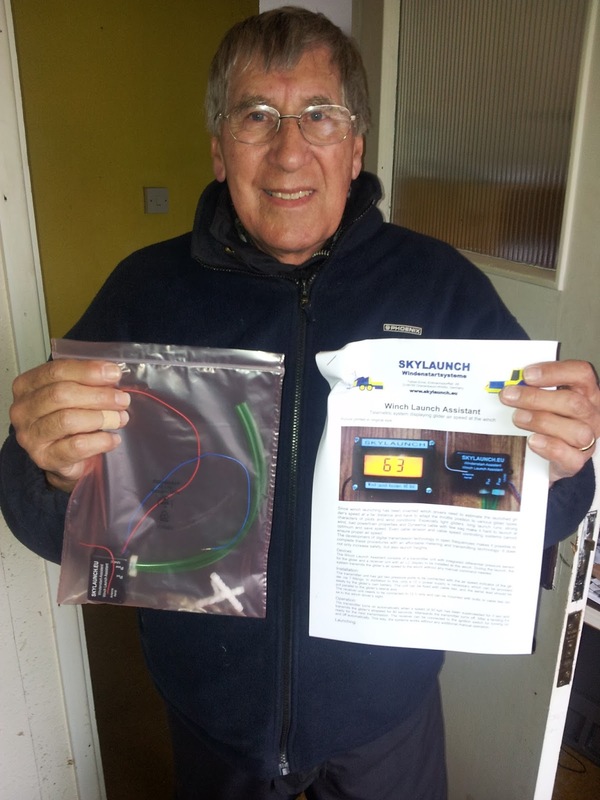 The few of us on site finished off the odd jobs from Wednesday and David Jesty and I then fitted the new Skylaunch “Winch Launch Assistant” transmitter to K13 G-DDMX. This piece of equipment was purchased for the club by member John Howe. It transmits the glider airspeed during a winch launch to a screen in the winch. Thanks John. Later in the day the committee assembled for another meeting. The BBC weather girl had suggested a dry day with clear skies. I looked out the window at home, blue sky. This was a bit of a puzzle as my interpretation of the local atmospheric soundings had suggested large amounts of cloud cover with the potential for wave. As I drove up onto Dartmoor on the way to the airfield I was confronted with a sky that was completely covered in low cloud. Engage “smug mode”. At the airfield, the wave was evident but the cloud cover was so low as to make it unflyable. 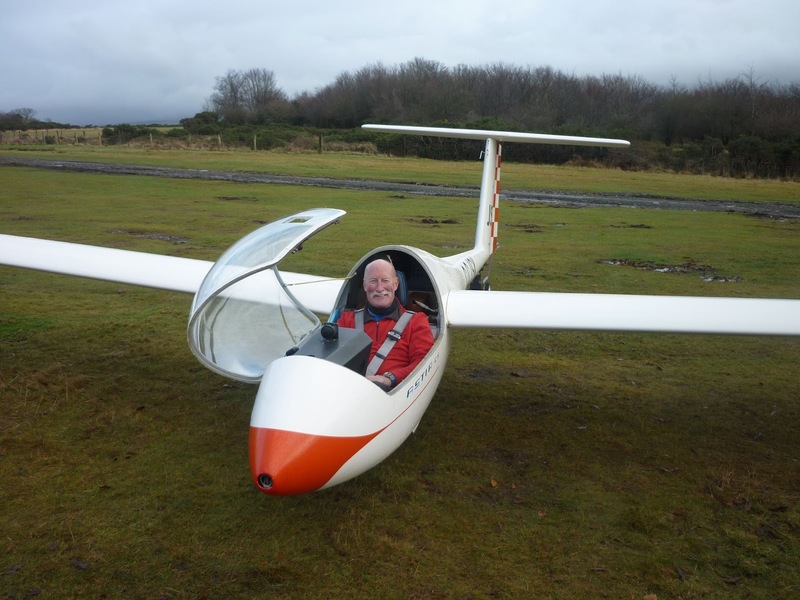 So nothing for it but to prepare the gliders and wait for the cloudbase to go up. Eventually, the cloud had risen enough to allow some flying. The cloud showed lots of rotor activity in the strong easterly wind so it was decided that instructor Ged and myself would take a 2 seater up to check it all out. The assembled members seemed delighted to sacrifice the 2 most experienced pilots first. Thanks chaps. Normally at Brentor when we have wave, the rotors and heavy sink are in relatively small areas. But not today. The rotor was evident from the minute we left the ground and continued all the way around the flight. We attempted to push out towards an edge in the cloud, where we expected the wave to be but it was too far away. After what can only be described as a character forming circuit, approach and landing it was obvious that it was too rough to permit any further flying. So we would wait until later to see if things improved. While waiting, apart from having lunch, the assembled club members managed to replace the Zugvogel main wheel and tyre, re-assemble the K8, and help with a rudder hinge inspection on the K13. So we now have two 2 seaters and two single seaters serviceable and ready to fly. 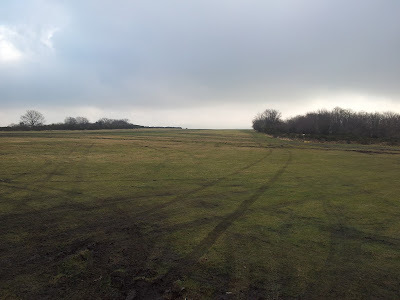 All of this was completed with a background drone from the tractors as Phil and his helpers spent the whole day rolling the airfield to improve the surface and start the process of repairing some of the winter ravages. 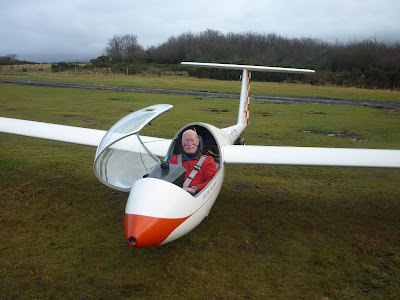 Unfortunately, the weather conditions did not improve and by mid afternoon the idea of flying was finally abandoned as the cloudbase rapidly descended once again. 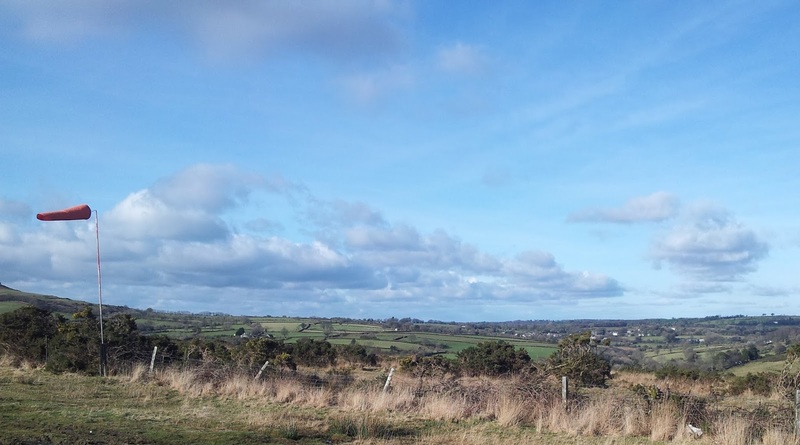 The weather forecast had confidently predicted that yesterday’s southerly would back to the south-east, with unlimited sunshine, and so it turned out. Which was enough to tempt an encouraging number of members anticipating the prospect of wave. 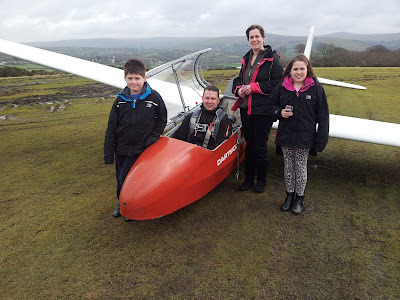 It was good to see so many people willing to give it a go, though, and a shame that some with other commitments did not get to fly. However, for those who did, such as Sunday regulars Sam Deeks, Leith Whittington, Dave Parker and Roger Appleboom, plus Chris and Karon Matten, Marta Radowska, and new member Chris, Darren Wills and Roger Green, there was the opportunity for momentary dalliances with the wave, usually preceded (and followed) by fearsome sink, leading to a swift downwind leg and (the aforesaid) boisterous approaches, where loads of (right rudder) crosswind correction was instantly transformed into loads of (left rudder) correction on touchdown for weather cocking - character and skill building stuff for all concerned! 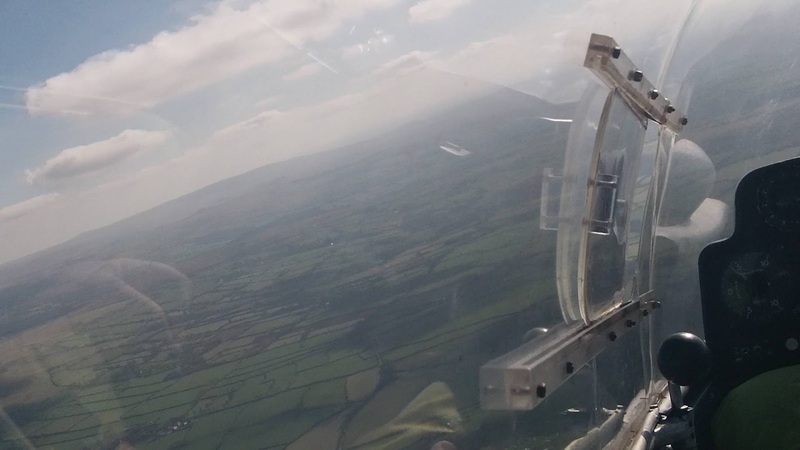 Particular mention has to be made of Robin Wilson’s flight of 45 minutes plus to 2200 feet, and Roger Appleboom’s third (ever) flight in the Bocian, in which he managed to find a line between Mary Tavy and the sugar factory which kept us between 1,300-1,600ft for 37 minutes (as illustrated by the accompanying stills from his video camera). Both successful connections with the wave were made in early afternoon, if that’s any help to you weather pundits. 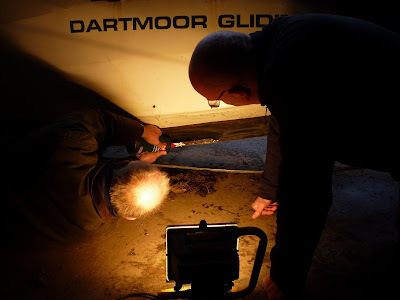 Thanks must surely go to Nigel Williamson for his sympathetic winching in very challenging conditions – and also to Chris Matten for taking over (when Nigel’s HobNobs had given up!). Don was a trifle hors de combat today with a dicky knee so thanks must also go to David Jesty for his un-rostered instructing. For me, thirteen flights without sight of an altimeter or variometer certainly honed my hunter’s eye … and appreciation for the Bocian’s, er, unique characteristics. The weather was definitely looking better. No rain forecast. Wind was initially 6 knots south east and it strengthened to 10 knots east, south east by the end of the day. The cloud cover gradually reduced throughout the day until it was clear by sunset. Frosty night to come then. Before flying the assembled members had to change ends, followed by de-rigging the K8 ( for a minor wing repair ), and rigging the Bocian to permit the C of A work to be completed. Phew. Iain Hann ready to flying with me. The flying was very pleasant with great visibility. 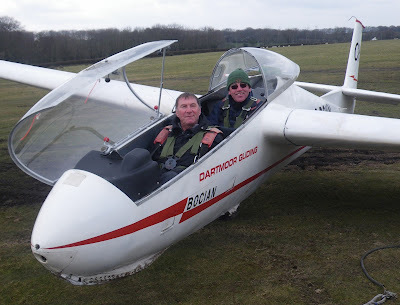 We welcomed father and son team David and Iain Hann who had a couple of air experience flights each. Several members maintained their currency while searching for the wave. As it turned out the teasing glimpses of wave were not enough to soar in until very late on when Alan Holland soared the K13 for 15 minutes or so in the now buoyant conditions. The flying day finished with Don and I doing some instructor training. Elsewhere on site, Vice Chairman Colin Boyd was hard at work fitting a meter to our water system. 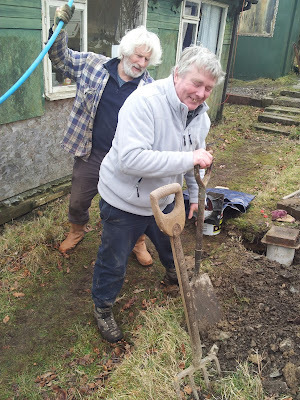 He even managed to get Don to help dig the hole. Now that’s what I call persuasion. 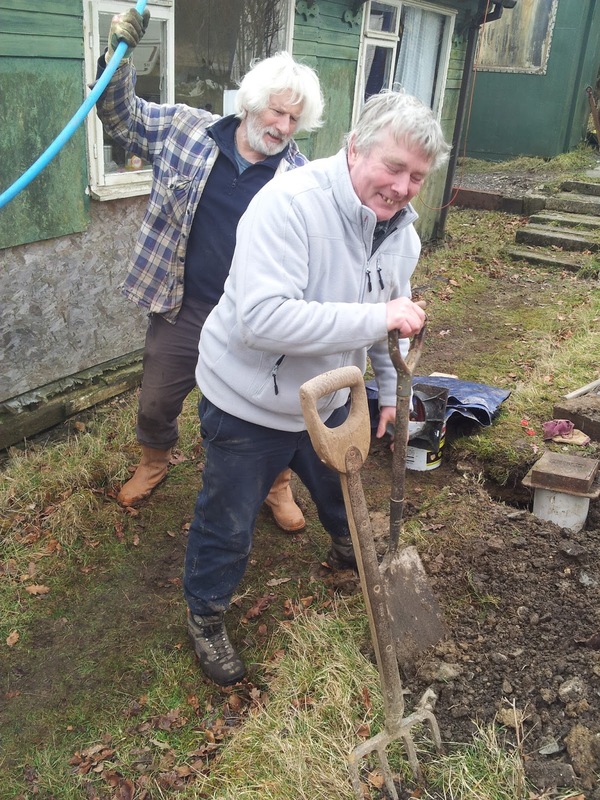 Colin cracking the whip to get Don to dig the hole. Martin Smith worked in the hangar to complete the Bocian C of A. He eventually appeared at the launchpoint with it and he and Don then completed a successful test flight. The aircraft is once again ready for work. Great news. Another wet day. Low cloud, drizzle interspersed with heavier showers and longer periods of rain. Today it was the turn of the other Astir syndicate G-CFJC ( otherwise known as Phil and Andrew ) to complete their C of A and ARC renewals with John Bolt. 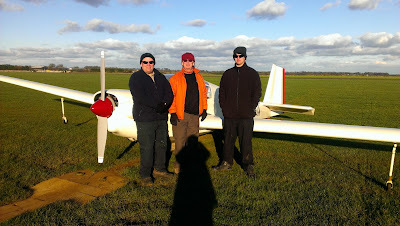 Andrew, Phil and Astir pictured on a somewhat sunnier day. Ged, David and I set about sorting out our current monowheel cable retrieve trailer. This now has 2 wheels again and plans are afoot to secure a spare. So a yellow trailer with 3 wheels. I wonder if we should paint “Trotters Independent Traders” on the sides ? And a reliant badge perhaps? 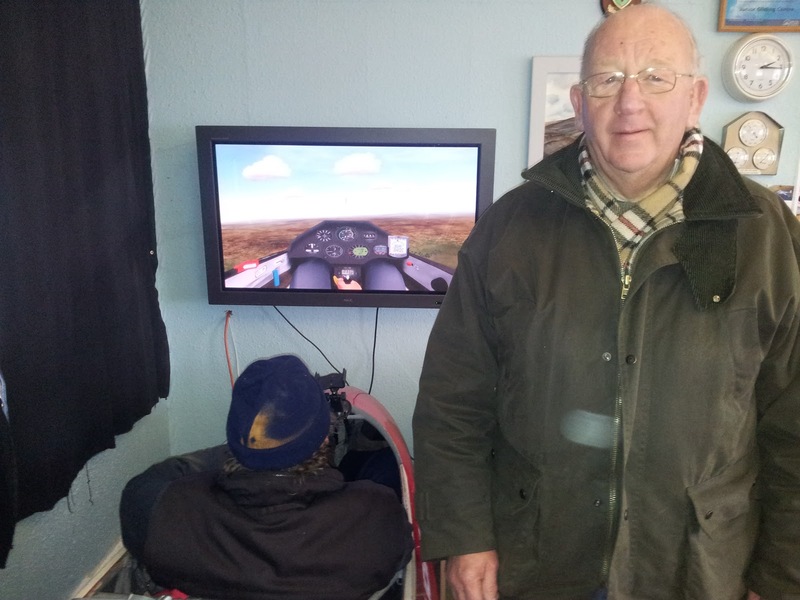 Steve Raine continued his cross country practice on the simulator and his techniques are showing a marked improvement although he did manage to land out on his return from Plymouth on one trip. Not surprising really, the wind was set to something like 25 knots from the north with only very average thermals and no streeting. Looking forward to Saturday already. We thought the game was up! In hot pursuit of Operation Pegasus, the Flying Squad appeared! In an unmarked car and plain clothes the hunt was on for aerial illegal immigrants. Thankfully, the silken tongued Martin Smith managed to dissuade Devon and Cornwall’s finest from searching the trailer park for visa free tourists, and even managed to charm some bone china mugs and leaflets from her! So if you see them around the clubhouse you’ll know that Operation Pegasus is what it’s about! That was in the short interval when it wasn’t dancing down with rain – so today’s ‘Sunday Soarers’, safe from having their collars felt, devoted themselves to earthbound tasks such as scraping the mud (no Moroccans – just mud, lots of it), out of the K-8’s skid and re-fixing the skirt with 26 sundry screws. They also attempted to repair the cable trailer, however the ‘punctured’ tyre, on examination, bore greater resemblance to an art teacher’s jacket elbow than a moulded hoop of latex for road use, however, a search of the ‘South East Asia’ quarter yielded up a replacement tyre, which hopefully will be fitted in time for Wednesday’s leathernecks to take to the skies in the (now greatly lightened) K-8. A forlorn looking monowheel trailer. As I sat watching “Match of the Day” and mulling over today’s events, it struck me that today was a day of 3 halves. Yes, I know, but this is new maths and if scientists can now have multiple universes and dimensions, I can have 3 halves. The airfield was very wet but today looked like we could at least maintain of currency if we were careful. 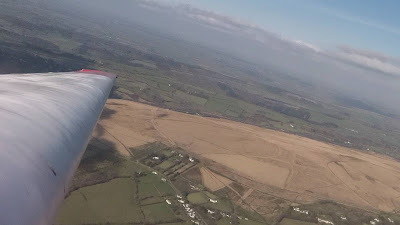 Cloudbase was fairly low with 1000 feet at best with occasional lower stuff mixed in. Wind was WNW veering to NW about 5 knots initially strengthening to 10 knots by the end of the afternoon. We welcomed visitor Dan Sharland who had an introduction to flying on the simulator to gain an appreciation of the aircraft controls followed by 2 circuits in the K13 during which he handled the aircraft well considering that this was the first time he had flown anything. We also welcomed returning member Andrew Beaumont who has returned from his winter hibernation in Mauritius. There was a lot of activity in and around the clubhouse and hangar. 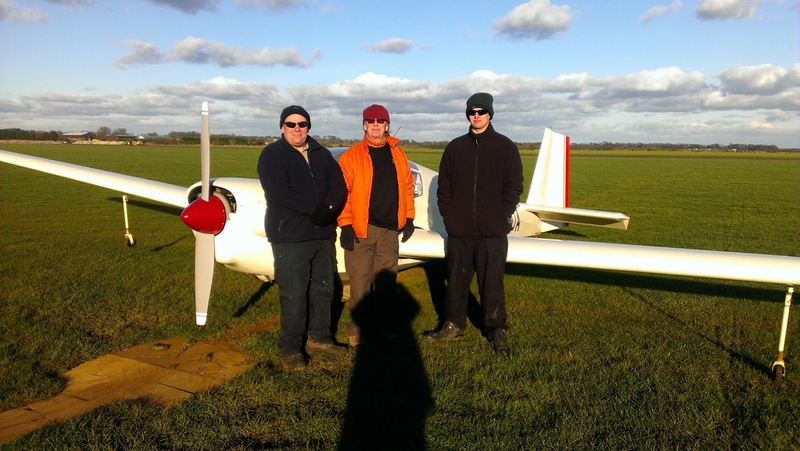 The Astir G-CJSK syndicate ie, Mike and Steve were working with Inspector John Bolt on the C of A and ARC renewal. Rick Wiles was working on his winches. CFI Don Puttock was working on various presentations. 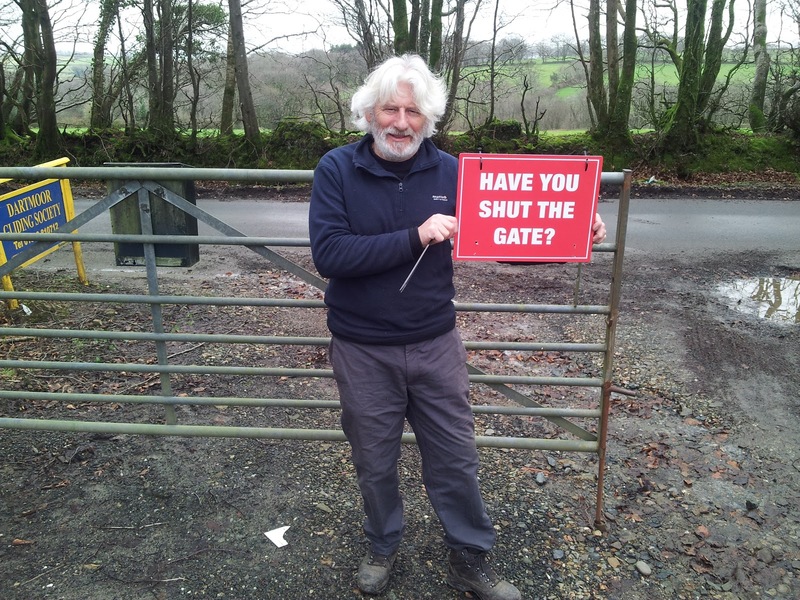 Deputy Chairman Colin Boyd seemed to be keen to put up some signs. Early evening a large number of club members assembled in the clubhouse for hot dogs, a can of beer followed by the evenings planned Safety Meeting. Safety Officer David Jesty presented the BGA’s new Winch Launch Safety DVD after which he led the lively discussions it generated. The weather has beaten us again. Although today the sky was mostly clear the northerly wind was very strong and gusty. 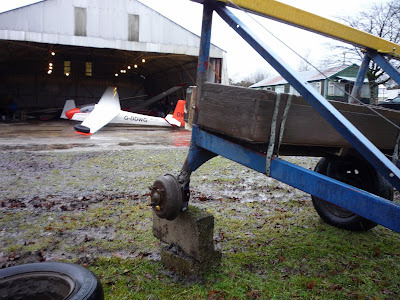 The overnight rain had also left the runway unbelievably wet. The flying list became the fire list; the first members to arrive got the seats closest to the woodburner! There was a little work done. The Zugvogel rudder return spring was refitted. One of the Landrovers had a puncture repaired and Colin Boyd’s beautiful K6CR G-CFUB had it’s annual C of A and ARC completed. Colin in FUB pictured on a much nicer day. Meanwhile, in the clubhouse, the simulator was given a good workout with David Rippon practicing circuits and landings, Steve Raine completed the Brentor, Launceston,,Roadford, Brentor cross country task and Mike Gadd and I completing flights to North Hill. 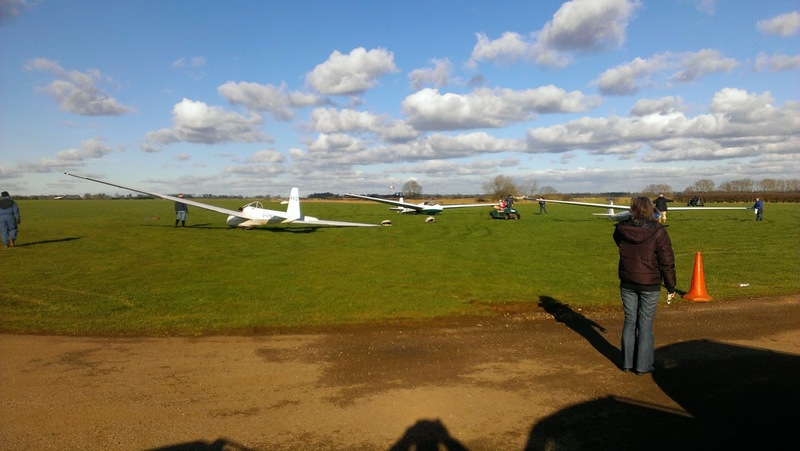 So about 200km flown on a day when you could hardly stand up outside. Rick and Matt Wiles and myself collected Don and drove up to Shenington before dawn with the task of Cross Country Endorsement exams for Matt and myself and field landing refreshers for Rick. We arrived 0930 to be greeted by friendly Sheningtonians and a cloudless blue sky and biting Northerly wind. After a relatively sleepless night I was keen to be the first up for Navex and field landings. 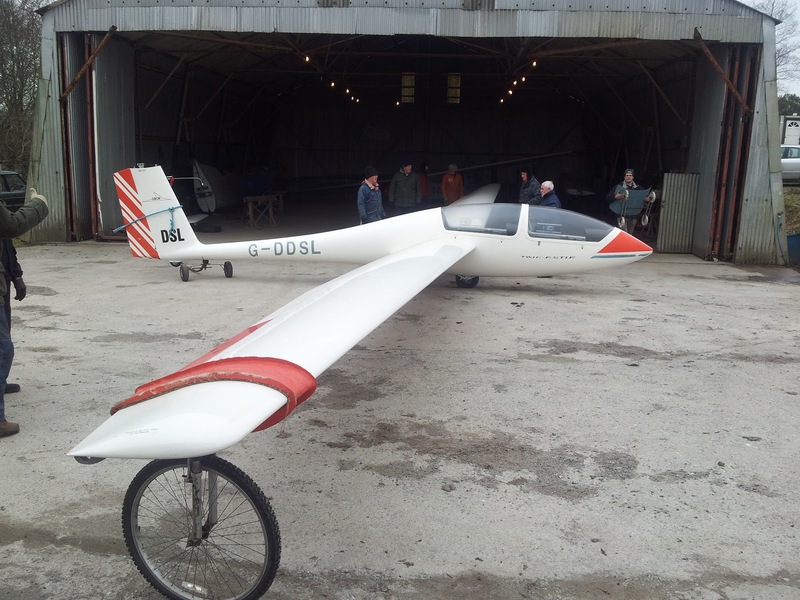 We motored off into 25kt at 340 first turnpoint destination Bidford gliding club - and hey, I found it! Turned South for next turnpoint and looking for my next waypoint realised we'd already flown over it, such was the tailwind. 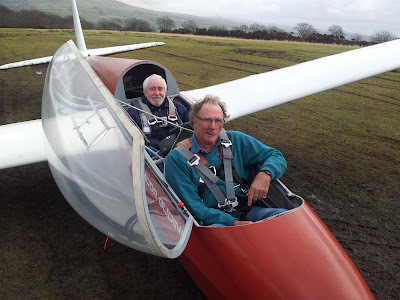 At this point Don decided to throw a spanner into my well made plans - I won't say what that was but it meant I had to think - brain wasn't quite prepared for that - but I did fine in the end and even the field landings were OK. 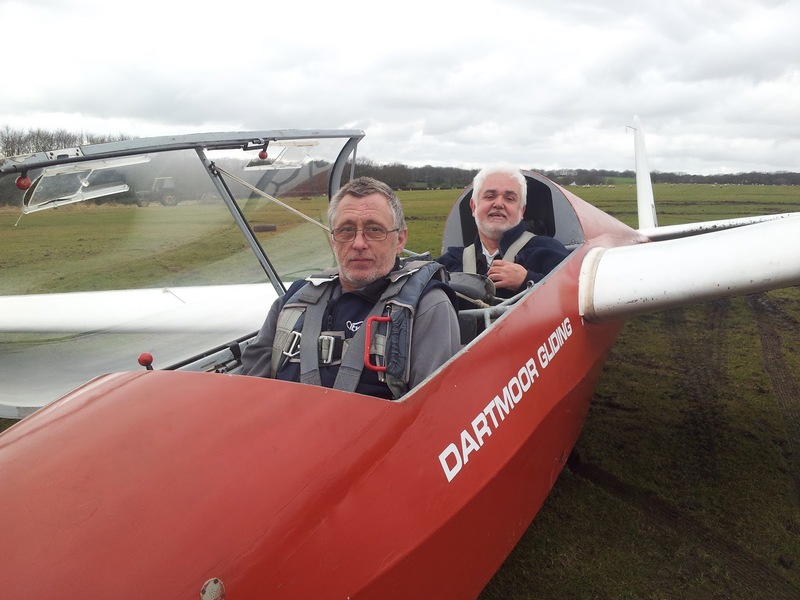 When we got back Matt had already got in a couple of K13 field familiarisation flights and Rick did the same. Matt then left to do his XC stuff and came back beaming - Ok there then - that meant he got his XC endorsement - I've still got the 2 hour flight to do. We drove back into a glorious Cotswold sunset. A good day. Many thanks to all at Shenington, and for Don's gentle way of examining, and his time and big big thank you to Rick despite offers to take over, did all the driving - 8hours in total!! I set out for the airfield today under a clear blue sky. Excellent. The day was exactly as forecast. Little or no cloud, strengthening wind from the north, north west, giving way to showers by evening. The airfield is still wet so it was decided to just use the K13 to minimise any damage to the surface. 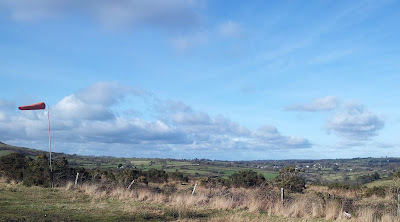 The unstable airflow started to give some thermal activity and by 2pm climbs of 4 knots were being reported and the cloud streets were a pleasing sight after this seemingly endless winter. 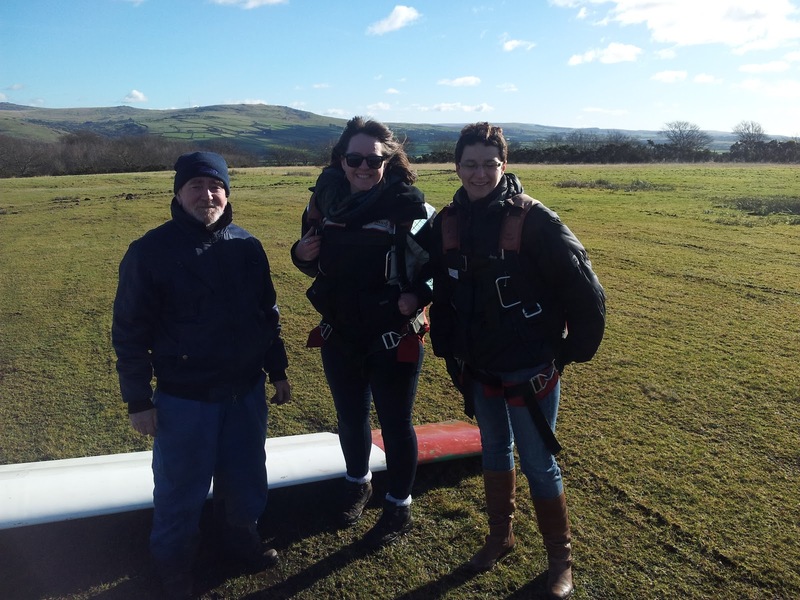 Ged, Sarah and Jo enjoying the winter sunshine. Visiting pilot Sarah Reed, a Silver C pilot from Usk flew with us today. As Sarah is studying at Plymouth University I expect she will be a regular visitor. 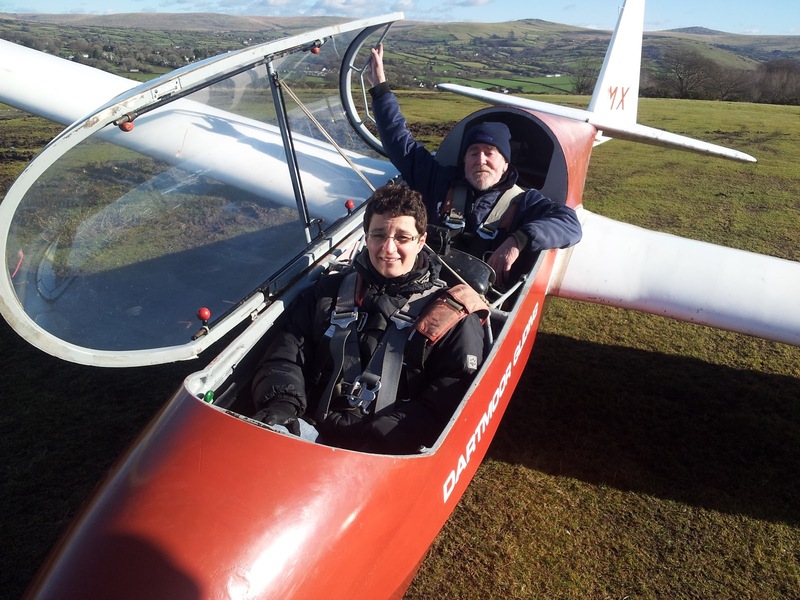 We also welcomed visitor Jo who enjoyed her flights with Ged. Best flight today was by Mike Gadd who chose to return after 30 minutes of playing at the 2400 feet cloudbase. Jo and Ged ready to go.